Back to the eBay Deals, good until the end of day on 5/20/18, coupon code PFREEMINI gets you a FREE “Google Home Mini” device IF you place an order of $150+ in eligible items. You have to add the eligible items with the Google Home Mini in the same shopping cart and enter the coupon code. The free Mini must be the specific models sold by the Google eBay store that are linked-to at the Google Home Mini promotional eBAY page. One free Mini per eBay user during this promotional period. The price drops in the shopping cart after you enter the coupon, so you’ll know whether your order qualifies or not before you place the order. 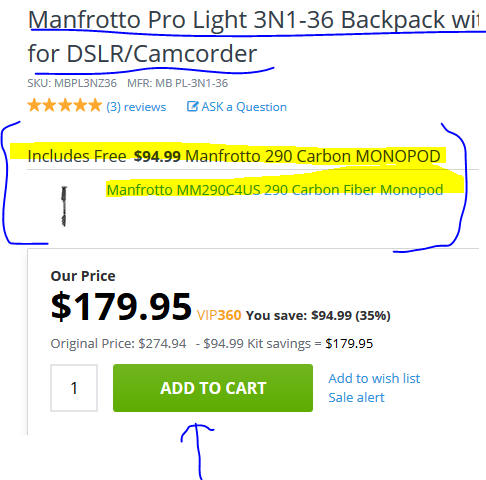 If you are not fond of battery grips, you can instead get a handful of other photographic accessories for the same price of $1700 by Focus (eBay and Focus directly: digital slave flash, camera backpack, 64GB Sony M-series SDXC card, Wasabi charger and two extra batteries, and LED Video light. Note that most of the above retailers are closed for Passovers, so orders will begin shipping next week. A quartet of Sony PRO E system lenses are currently getting a FREE B+W Circular Polarizer MRC Filter at B&H Photo. The B&W is included automatically by B&H. Participating lenses are the 70-200/2.8 OSS, 100-400 GM OSS, 100/2.8 STF GM OSS and 85/1.4 GM. Flying time! The DJI Spark Mini drone is bundled with the DJI Part 4 Remote Controller (goes for $100 on its own), together going for $349 with free shipping at Adorama in all color scheme, and in the green color scheme at B&H Photo (orders accepted again at 7pm eastern tonight). Do two posts in a row make a theme? After the B&H Studio/Lighting offers we have one from Adorama! It’s a Profoto offer. With the purchase of the select Profoto B1X or B2 kits, you get a FREE Profoto OCF 24″ Beauty Dish with Deflector Plate. 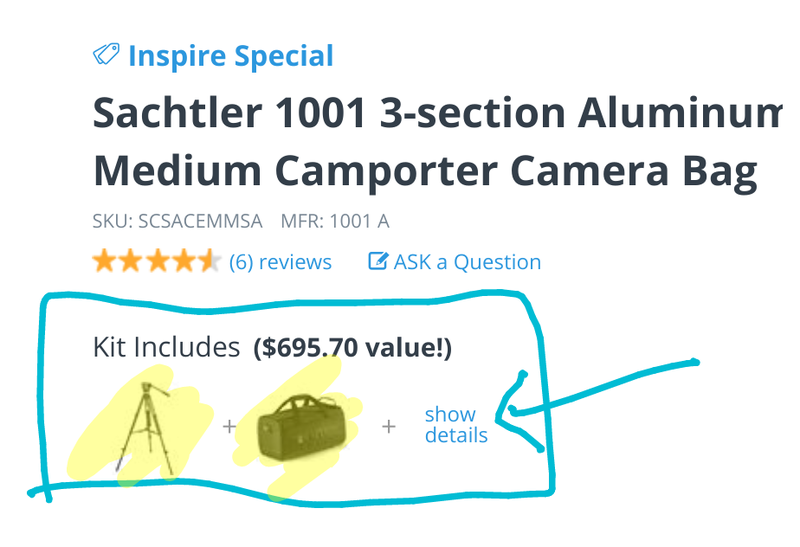 The free offer is mentioned on the individual product pages of participating items, and it is included automatically by Adorama while this promotion is running. No coupon, no rebate needed! The Beauty Dish goes for $179 on its own. CORRECTION: the coupon code is FILMFEB02, not FILMFEB92. I just noticed it now. Side-effects of typing on a keyboard without a numeric keypad. All apologies for the confusion! And now a month-long coupon from KEH Camera. Running until 2/28/18, coupon code FILMFEB02 [CORRECTED COUPON CODE!] gets you a FREE Roll of Film with the purchase of a Film Camera priced $49 or more! The DJI Spark Mini Drones go for $499 in new condition at authorized dealers. Adorama sells them for the same price, but two of the color schemes, the red color scheme and the meadow green color scheme get a free Adorama $50 gift certificate and a 32GB Sandisk Ultra microSD card included by Adorama during this limited time promotion. If you prefer the “Fly More” kit, which goes for $699 at authorized dealers, Adorama is selling it for the same price, but bundling a $70 Adorama gift certificate and a 32GB Sandisk Ultra microSD card for the white color scheme and the red color scheme and the sky blue color scheme. These are limited time offers that expire 9/20/17 or earlier if sold out. UPDATE: a couple of fulfilled by Amazon 3rd-party sellers have the white DJI Spark Mini Drone for $454 with free shipping. Amazon’s own price remains $499.